On April 2, 1917, President Wilson asked for a declaration of war against Germany. One year later a Loyalty Day Parade to promote the purchase of Liberty Bonds was held on Saturday, April 6, 1918. The Third Liberty Loan Act sold liberty bonds to cover the war expenses of the United States. 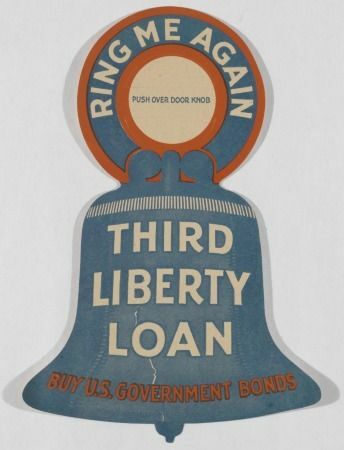 In effect, the bonds were loans from citizens to the US Government which would be repaid with interest in the future. The week one hundred years ago had started out on Monday morning with the Boy Scouts decorating the doorknobs of homes with a Liberty Bell paper door hanger. A parade was quickly organized for Saturday. The mayor asked the stores to close from 10 – 1 o’clock. People were encouraged to decorate stores, homes, and floats with flags and other patriotic materials. The parade formed at the high school and went through town and on city streets, ending up at the city park south of town. 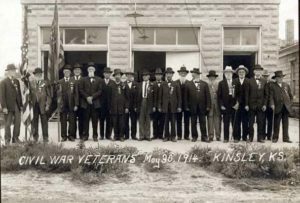 According to the Kinsley Graphic published on the same day, “The procession was taken out of its assigned line of march to pass the home of Mr. Goldschmidt, who had expressed regret that he was unable to view it, and the band stopped in the yard and played for him. It will be another pleasant memory to all of us as the days pass.” The poignancy of this gesture to a respected businessman of the community becomes clear when printed a couple columns over in the same paper is Fred Goldschmidt’s obituary announcing his death on April 9. 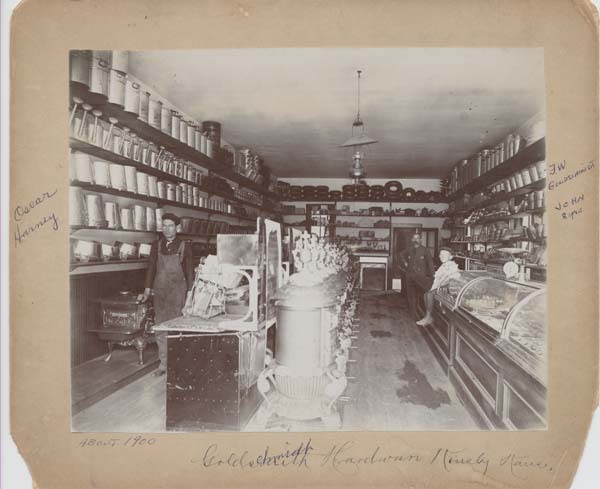 Goldschmidts Hardware Store (1901) with detail of Fred 1860-1918) who came to Kinsley 1885. The parade terminated in the city park south of town. “Mrs. C. W. Beeler stood on the platform and led the singing. Rev. W. G. Baker was the first speaker. He explained that being a new-comer he deemed it advisable to make his stand on the war clear. He stated very emphatically that he was a loyal citizen and for the vigorous prosecution of the war. He was followed by Rev. 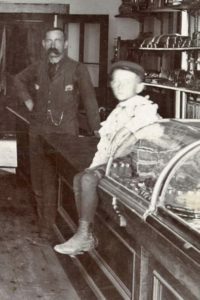 Emmanuel Jones, whose topic was ‘The flag.’ He urged that at all times and in all places every citizens show his respect for the flag and our patriotic airs by standing uncovered when the flag is passing or the national airs are played or sung…. W. T. Williams was the last speaker, and delivered a stinging denunciation of all forms of disloyalty to this government. Both newspapers rated the day and the drive for Liberty Bonds a success. This entry was posted in Uncategorized on April 3, 2018 by Joan Weaver, Kinsley Library Director.